Fabricated curved totem, powder coated and fitted with a combination of fabricated and cut out aluminium letters, all powder coated. 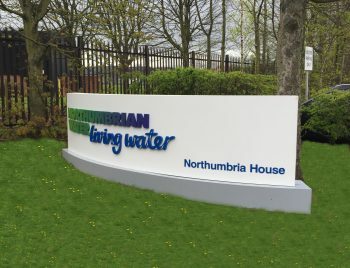 The totem is located at the entrance to Northumbrian Water HQ IN County Durham. Chameleon totem sign with a hinged glazing panel allowing the removal and replacement of the graphic insert panels. Eye catching identity signage is best achieved by investing in the construction of a free standing totem, which can create an imposing external feature, reinforcing brand awareness and at the same time promoting a modern stylised image. 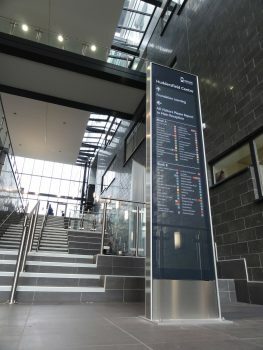 Totems are instrumental in providing that all important first visual impression as they welcome users to their destination Such signs will effectively welcome and inform user groups of the presence of the building or estate that they are visiting. All of our totems and bespoke fabrications are designed and engineered to exacting specifications and subjected to structural calculations where appropriate to provide a low maintenance solution and many years of high quality external branding. The totems will consist of a robust steel or aluminium frame, clad in a variety of materials – dibond, powder coated aluminium, stainless steel or flexface material. 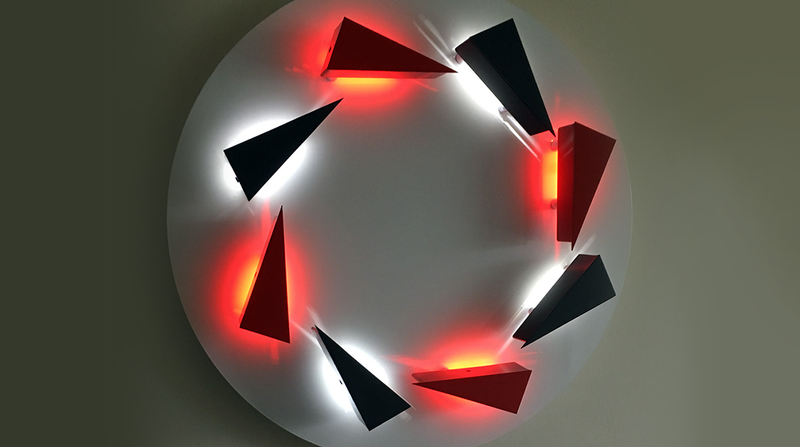 Panels can either be illuminated or non-illuminated, flat faced or curved.